On 6 December 2018, the ACCC released a report detailing its’ most recent investigation into the operation of petrol price cycles in Australia. This latest ACCC report entitled: Petrol Price Cycles in Australia: December 2018 (https://www.accc.gov.au/publications/petrol-industry-reports/petrol-price-cycles-in-australia) provides an in-depth discussion of how petrol price cycles work and explains how motorists who have a knowledge of the operation of these cycles can use this major capital city market phenomenon to their advantage. But the report also debunks many of the sensational (and wholly inaccurate) accusations that have historically been levelled at our industry in respect of petrol price discounting cycles. So, let’s look at some of these accusations that have now been comprehensively exposed as the myths that they truly are. This has always been an interesting claim which, curiously, is repeated by ACCC Deputy Commissioner Mick Keogh in the ACCC media release that accompanied the release of the ACCC report this week. Yet the detail contained in the ACCC report shows quite the opposite. Petrol price cycles occur in markets where the competition is intense, bordering on extreme. This market phenomenon is driven by the presence of significant numbers of independently operated service stations (including dealer businesses that display a major brand at their site) who seek to progressively and steadily undercut the prices of their competitors in an effort to attract increased numbers of customers. This discounting occurs over a sustained period (an average of 35 days in Sydney and Melbourne) in a game of ‘discount leap frog’ that continues to the point where the average retail prices fall below the actual cost of fuel to fuel retailers (see Chart A below). Chart A: The operation of the petrol price cycle produces fierce discounting behaviour that ultimately results in fuel retailers selling fuel below cost towards the end of the petrol price (ACCC 2018) in order to protect sales volumes. As is clearly shown in the ACCC’s chart above, there are periods in every petrol cycle where the average petrol price in Australia’s major capital cities falls below the supply price (which includes wholesale fuel cost, Federal taxes and freight). This represents a significant loss to fuel retailers, particularly when you consider that the retailer must pay the costs of retailing the fuel (i.e. staff wages, rent and electricity) over and above the supply price. “It goes without saying that if petrol price cycles were truly a market construct designed by fuel retailers to maximise profits, then we have manifestly failed as an industry to achieve this aim”, said ACAPMA CEO Mark McKenzie. No retailer in their right mind would seek to sell fuel below wholesale cost unless they were forced to do so by fierce market competition. In short, the ACCC analysis leads any objective reader to the conclusion that petrol price cycles are an indication that competition is alive and well in a geographic market – almost bordering on extreme. As just discussed, the end of every petrol cycle fuel involves retailers selling fuel below supply cost. “In other words, they are losing money at this point of the cycle”, said Mark. It therefore follows that retailers with substantial number of sites are losing more money than those with fewer sites, because of selling a large volume of fuel below the cost of supply. Eventually, the larger fuel retailers in the market (noting that this differs between individual markets) reach the point where they can no longer afford to participate in the discounting ‘game’. This is why it is generally, but not always, the retailers with the biggest presence in individual markets that move their prices up first. As these retailers increase their price, other market participants will generally follow. 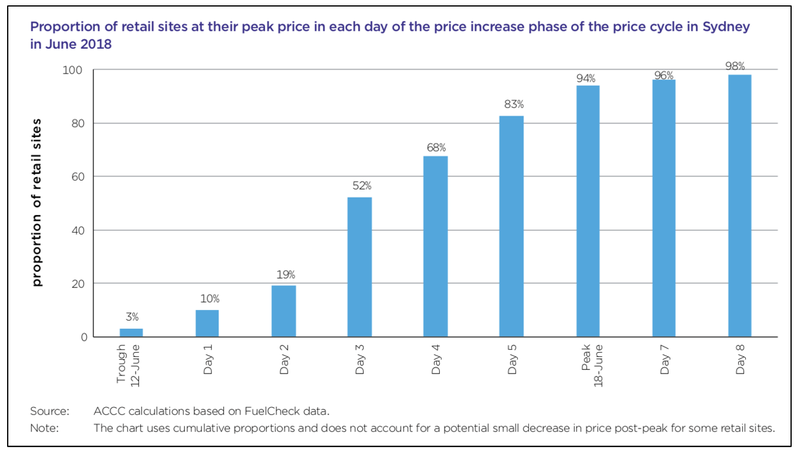 But, contrary to the claims made by motoring associations (and politicians) that all fuel retailers increase their prices at the same time, the ACCC investigation shows that it will generally take a week for all fuel retailers to increase their prices to the new market average (See Chart B below). Chart B: Generally, it takes about a week before all fuel retailers increase their prices to the top of the fuel price cycle, providing an opportunity for informed motorists to make significant savings (ACCC 2018). “Rather than bleat on about how fuel retailers are increasing prices with apparently large point-in-time margins – neatly avoiding the fact that this occurs after a period of sustained losses – motoring Associations who are truly representing their members interests could be suggesting that they should buy fuel now from those retail sites that are still selling fuel at lower prices”, said Mark. But, as the ACCC report clearly outlines, motorists that are closely watching the market can buy fuel as the cycle is turning up and then can refill their tank a week later – as the next cycle of price discounting starts and prices start to fall again. “This is an interesting one and is a claim that I have never understood”, said Mark. Surely if, due to severe and intense market competition, fuel retailers are forced to progressively discount their prices in response to the discounting behaviour of their competitors, motorists benefit over time through lower average fuel prices over the life of each cycle. Given that the petrol price cycle operates for up to 35 days in Australia’s largest capital cities, there are large periods of time where the average petrol price is below what might be described as the optimum retail price (i.e. costs plus reasonable profit). Chart C: Average Petrol prices in cities with a petrol price cycle generally pay a lower average price throughout the year, compared with those cities that don’t have a petrol price cycle (Source: Informed Sources). Chart C shows that motorists living in the three largest capital cities (i.e. Sydney, Melbourne and Brisbane) – where the competition is so extreme as to generate petrol price cycles – pay lower average prices than motorists in the three smallest capital cities (i.e. Canberra, Darwin and Hobart) – where the competition in these smaller markets, while strong, is not extreme. “If you asked motorists in these smaller capital cities, or regional Australia, whether they would prefer greater levels of price volatility in return for lower average fuel prices over time, I am sure that they would likely say bring on petrol price discount cycles”, added Mark. Importantly, the discussion of the three myths discussed above debunks perhaps the biggest myth of all. That is, that the fuel retail industry somehow controls petrol price cycles to manipulate the market to its’ financial advantage. Basically, petrol price cycles provide stark evidence that market competition is fierce and are ultimately delivering the lowest possible average price to motorists when considered over time. “Sure, we understand that the volatility annoys motorists”, said Mark. “But if motorists develop good knowledge of the petrol price cycle movements and patronise those businesses that are last to move as the cycle goes up, then they will do much better over time than they would if petrol price discount cycles did not exist at all”, added Mark. 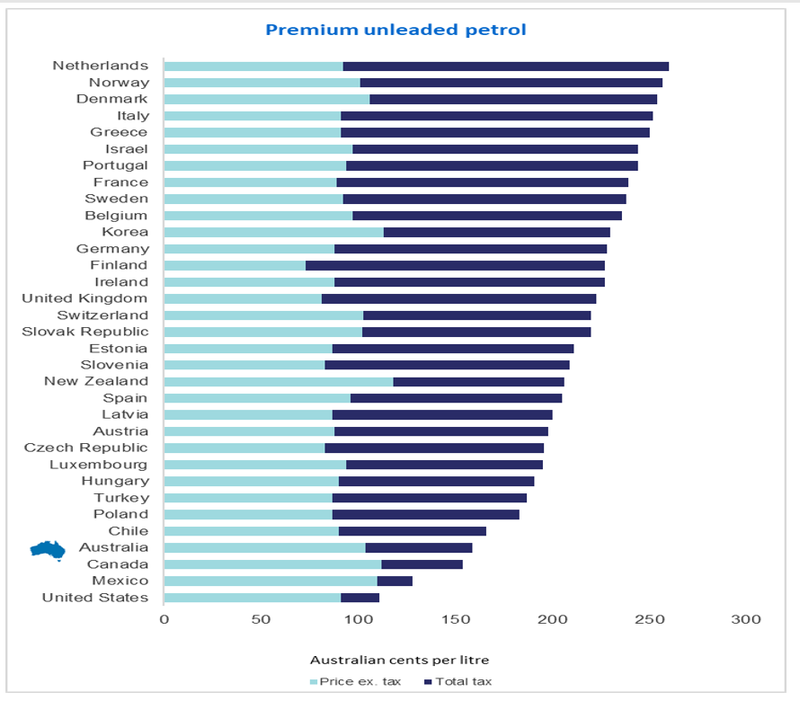 In fact, petrol price discounting cycles are a large part of the reason why Australia’s enjoys the fourth lowest petrol price of all 33 Countries that comprise the OECD (See Chart D). “I am sure that many in our industry would be very happy to support anyone calling for an end to the petrol price cycle in Australia’s five major capital cities”, added Mark.